Today, Hiroshima Carp fans had the chance to fete their heroes at a victory parade for the first time in 41 years and an estimated 310,000 took to the streets to do just that..
Thousands, dressed in red, lined the route and packed Mazda Stadium under clear blue autumn skies this morning. Here’s how the celebration looked through the eyes (phones) of the fans. Though, if you were there before 7am you could grab shots like this! And maybe wished they’d stayed how and watched it in TV. Some wondered whether the team’s collapse in the Japan Series after a strong start would dampen the atmosphere, but there can be no doubt that there was nothing but pride and appreciation on display in Hiroshima today. 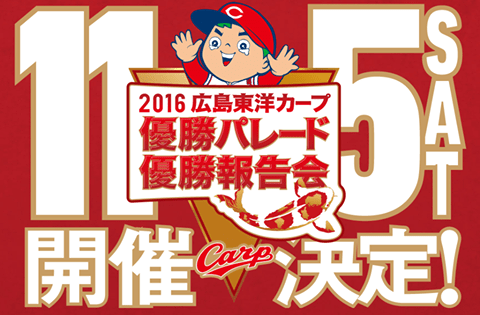 At time of writing, we don’t know whether this will be a parade to celebrate the Carp’s first Japan Series win since 1984 or the first pennant win since 1991. Either way, there will be thousands of people along Peace Boulevard to cheer their local heroes. Photos from Sanfrecce Hiroshima’s 2012 J League Championship victory parade.